Alice in Wonderland (2010) | Anime etc. 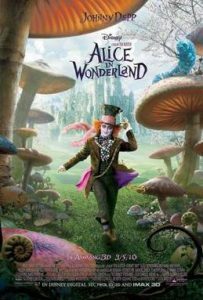 Tim Burton’s diabolically tedious Alice in Wonderland is the equivalent of watching videogame cut-scenes for 109 minutes. Wonderland has been the source or inspiration of great (or intermittently great) fantasy films since before Burton’s birth: everything from The 5,000 Fingers of Dr T to Time Bandits, from The Company of Wolves to Spirited Away, from Labyrinth to Coraline. The Matrix had debts to Alice, of course, as did Avatar (the hero’s adventures on Pandora are presented as a set of dreams from which he’s increasingly reluctant to wake). And let’s not forget last month’s The Lovely Bones, which for all its problems and stumbles had more of Caroll’s spirit than anything on show here. Scripted by Disney’s Linda Woolverton, who had writing credits on Disney’s toon blockbusters Beauty and the Beast and The Lion King, Burton’s version starts with a 19 year-old debutante Alice (Mia Wasikowska) – only she’s called Alice Kingsley now, and weirdly has a dad called Charles Kingsley in an obscure nod to the Victorian author of The Water Babies. Faced with being married off to an aristo twit, Alice follows the white rabbit down the hole, and spends a few minutes in a straight version of Caroll’s book, doing the usual “Drink me and grow small/eat me and grow tall” routine. Then she gets out into Wonderland – or “Underland,” as Burton insists on calling it – and it all goes horribly, horribly wrong. What we get is an unbelievably bog-standard fantasy adventure that makes Prince Caspian or The Golden Compass look like Lord of the Rings parts one, two and three. As Alice wanders vapidly from forgettable scene to forgettable scene, filling time before her ordained battle with the Jabberwocky (yes, that’s the plot), I was filling time myself, counting Wasikowska’s costume changes (it felt like more than poor Natalie Portman had in the Star Wars prequels) or trying to guess when Johnny Depp’s Mad Hatter (as pretty and forgettable as the rest) would do his Shrek voice again. I was also trying to remember when I’d last been so bored by a fantasy film. By the end, I’d decided it was Dragonball Evolution, though I had a few Nam-style flashbacks to Warriors of Virtue, which was the one with the kung-fu kangaroos. Alice is extremely pretty in a blown-up Playstation kind of way (I paid to see it on the big Odeon screen in London’s Leicester Square, and in 3D); Alan Rickman is perfect casting for the Caterpillar, and would be worth seeing in a proper version of the book; and the first quarter-hour is fair enough. The rest of it constitutes Tim Burton’s absolute worst film (Planet of the Apes is a blast in comparison), switching Carroll’s dreaming for CG anaesthesia. Weirdly, Alice has numerous parallels with a previous Disney effects fantasy from a quarter-century ago. Return to Oz (1985) was a similarly scary sequel to a children’s classic, with animatronics rather than CGI, but it was exciting and imaginative in all the ways Burton’s film isn’t, partly because it could draw on Oz author’s L. Frank Baum’s own sequels to his story.